Click the banner above to go to the Curious Critters web site. How do you photograph a squirrely baby squirrel, a slithering fox snake, or even a one in two million blue lobster? If animals had personalities, what would they sound like, and what would they tell us about themselves? 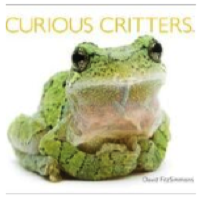 Half Day's curious kiddos and staff learned the answers to these questions and more during their time with the author/photographer of the Curious Critters series of nonfiction books, David FitzSimmons. Students were highly engaged throughout the large group sessions as they tried breathing through their skin like an Eastern Spiny Softshell Turtle, counted mites on a Red Flat Bark Beetle, and pretended to explode their guts like the California Sea Cucumber. We were even treated to a sneak peak at his upcoming book Salamander Dance. All of this took place as students learned about the process of going from photographs on display, to animals with distinct voices, through numerous revisions, to multiple award winning published books. 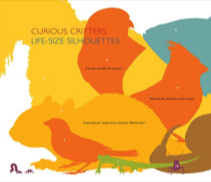 Everyone was amazed that the Curious Critters books took 50-80 revisions and that one of the animals had to be photographed 266 times! Talk about perseverance! During the small workshop sessions, Mr. FitzSimmons taught student ambassadors about important photography equipment like tripods and lenses. He introduced them to terminology such as foreground, alpenglow, and golden hours. Students learned that the surprising secret behind the octopus photo on the cover of Curious Critters Marine is that after three days of trying to get a good photo, his brother had to use a hotel hairdryer to eliminate condensation on the tank while David took the photo. The award-winning photographer gave student ambassadors specific photography tips and gave them time to practice what they were taught. Classroom teachers reported that the ambassadors couldn't wait to share what they learned about creating depth and using the rule of thirds so that they and their classmates will be able to take better photos with the iPads they're using at school. Some students immediately wrote notes of thanks telling Mr. FitzSimmons how much they LOVED meeting, learning from, and being inspired by him. According to David FitzSimmons, he felt the same about his time at Half Day. "I had fun working with you, meeting your colleagues, and, especially, sharing my work with all the talented, enthusiastic, and smart students at Half-Day School." Through his words and example, David FitzSimmons taught us all to, "Think about your dreams. It takes a lot of work, but you can achieve them."